At some point in science class, we all had to learn the process of photosynthesis. The most important detail to come out of all those lessons was that plants need sunlight. In most cases, that information is only put to good use when decorating your home with household plants. You know to keep them in direct sunlight, or at least near a window. According to a report from The Verge, Sun Tianqi, a Chinese roboticist and entrepreneur, saw an opportunity to innovate by creating a six-legged toy robot called "Hexa" through his company Vincross that can bring itself to sunlight. How Can Hexa Create a New World For Plant Life? Last year at a forum, Tianqi claimed the project was actually a remake of an earlier installation he has been developing since 2014. At the forum, he referred to the project as “Sharing Human Technology with Plants.” Tianqi claims that "plants are inexplicably passive. You can cut them, burn them, and pull them out of the earth, and they do nothing. They have the fewest degrees of freedom among all the creatures in nature." His goal was to give plants a similar freedom by attaching a potted plant onto a mobile robot. It's a wonderful gesture to show a passion for plants in your office or at home, but the technology could innovate gardening and parks with small mobile plants that could be more self-sufficient in the future. What Else is Hexa Capable of? Aside from providing mobility to plants, Hexa was created through a very comprehensive ecosystem called "MIND." The system is a combination of programming language, a skill store of sets of coding submitted by developers, the mobile app, and a 3D simulator where developers have a virtual screen to test Hexa through virtual environments. The spider-like robot can take part in search and rescue missions, dance, and more. 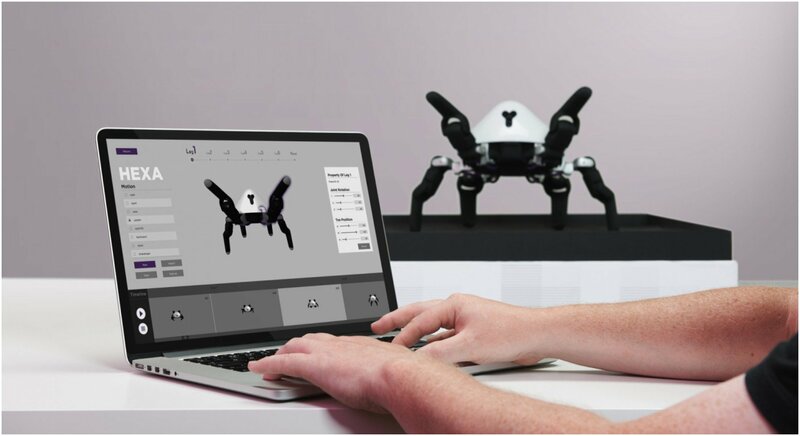 At this point, Hexa can move, climb, and carry items, It also has a 720p camera, night vision, a gravity sensor, three-axis accelerometer, distance measuring sensors (lasers), infrared transmitter, and other features. There's no telling how Vincross will develop Hexa's ecosystem but that's the fun of the project. Tianqi is using Hexa to make plants mobile, but that's just the first step. Someday, the technology could be used for a lot more.